The Magician (R) says your conscious mind is your sense of self – your individuality and you are capable of intense focus here. Make clear statements of intent – always in the present, looking into both the exterior and the interior worlds to assess the “facts” of daily living. Your conscious mind initiates, gives orders and stimulates a responses – it brings spirit into matter and vice versa. Truth always comes through goodness. Stop hesitating and confront your problems – stop limiting yourself. When you are not applying yourself in the right way, holding yourself back or fearing failure – you can not achieve anything. Be receptive to guidance, change your attitude and trust that your “true” hearts desire is always beneficial to others. Come to know yourself – then BE yourself. When you lack will power and can not seem to cope with the obstacles, you become too busy trying to find the easy way out and this makes you vulnerable to undercurrents and possible deceit, you will not be aware when someone is not telling the whole story. The proper flow of energy becomes blocked and your purpose becomes confused – which leads you to doing nothing. The power is still there – you simply can not use it productively. Depression, mental disquiet and fear create problems – energy or spirit enters and you do not know how to direct it into outer reality. Ground the energy or it will become trapped in your body, forcing itself on your awareness as anxiety and you will experience “burn – out”. Channel your experiences in a productive direction – learn to understand, structure and direct your experiences towards the service of the community. Look deeper into your situation – go deep within yourself and use the divine power that is available to you. What skills and abilities are needed in this situation? How are you communicating with others? What do you want others to believe or see? In the first position: Same as upright but to more or less extent. In the second position: Overconfident or needlessly pessimistic about physical conditions. Misuse of resources. Building on wrong or inadequate foundation. In the third position: Either too reliant on yourself being much too active, or waiting for God to take care of everything being much too passive. Problems with knowledge/responsibility. Must learn this before more progress is possible. In the fourth position: Too much confidence, or too little. Tendency to worship an idol, to create a superior or false image in one’s heart. In the fifth position: Difficulty applying personal dynamism to life situation. May seem like forcing a round peg into a square hole. May not be fully accepting your role or potential. Abusing your role? In the sixth position: Your potential is overriding all other aspects, some unnecessarily. Give more of your present a chance to move with you into the future. You may not be opening honestly to the call, fearing the changes it all bring. In the seventh position: Perhaps you fear yourself, what you may do with your knowledge. Or, perhaps you do not have enough respect for your position and your power to affect others and may be planning selfishly. In the eighth position: Things so good-where to from here? Manipulation, abuse of situation. Not taking full advantage of moment. Not rising to full potential. 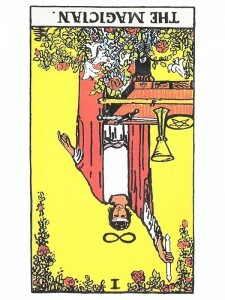 In the ninth position: May get somewhat lost in yourself and the ambiance of your situation. Don’t try to freeze the moment. Keep an eye on of the source of your pleasure. In the tenth position: This may be traumatic, or easily integrated – it’s up to you.